There is a lot of confusion about how diet advice overlaps these days. People follow paleo diets, low-carb diets, low-carb high-fat diets, and a wide range of other healthy eating plans that are designed to address different problems and support different health issues. One issue that a lot of people talk about is avoiding dairy products. After sugar and wheat, I think that dairy might be the most vilified food group in modern diet literature. To be fair, there are a lot of people who have serious problems eating dairy products. The majority of us do not possess the proper enzymes to digest the lactose in dairy. The ability to digest milk products properly is something that we all have as babies, but for most of us as we grow older, that ability naturally goes away. There are a few populations of human beings who evolved to have the ability to digest dairy as adults. That was an advantage for the survival of the race in difficult climates, but it did not become a universal trait for the entire human race. The food industry has come up with a number of great alternatives for dairy, but many of them won’t work for people on a low-carb high-fat diet. Products such as soy milk and almond milk are often processed with added sugars to improve the flavor. It’s important to read the labels and understand what you’re taking into your body every time you try a new food. For most of us, digesting dairy may be a subtle issue that we don’t even recognize. The way to tell if you have problems with dairy products is to go for a couple of weeks without any dairy products in your diet, and notice if you feel a difference. Then reintroduce some dairy, and see what the effect is. As with so many things in dieting, it all comes down to figuring out what works for you personally. When I’ve done the dairy experiment on myself, I have noticed that eating well aged cheeses is no problem for me at all, and eating butter and fresh cheeses tends not to be difficult on my system. However, drinking milk does give me an upset stomach after a couple of weeks avoiding it completely. I can take heavy cream, aged cheeses, most hard fresh cheeses, and I can even tolerate cottage cheese and sour cream. (I could probably eat yogurt as well, but personally I don’t like the taste. I always say, if something tastes good with yogurt, it will taste fantastic with sour cream.) Knowing this about myself makes it easier to make my choices when I’m deciding how I should eat, both during a regular low-carb high-fat diet day, and on a carbohydrate reload day. If you do eat dairy products, it’s best to avoid the ones that are fresher. Aging dairy products reduces the lactose, because the aging process promotes the growth of bacteria which consume the lactose. Not only is it possible that the lactose in fresh milk products is something you cannot properly digest, it’s also important to note that lactose is a sugar, and it’s one that enters bloodstream very quickly. The less processed a milk product is, the more sugar you’re taking in when you consume it. Similarly, it’s always best to focus on milk products that are higher in fat. The fat in fresh milk products is a healthy saturated fat, and higher fat milk products will naturally have less lactose because more calories will be coming from the fat. 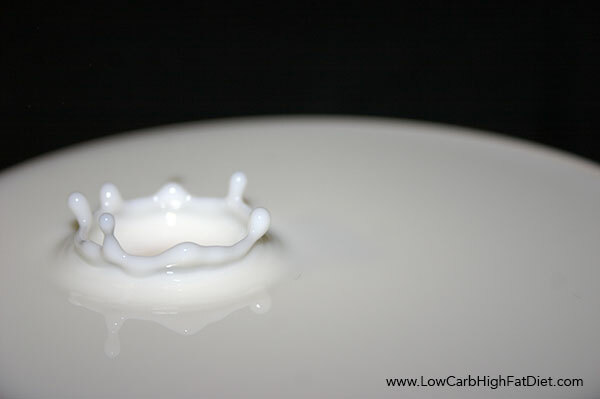 Also, when lower fat products are produced, such as skim milk, often the fat is removed and replaced with sugars. It’s necessary to do that in order to make the product taste good, but obviously that’s not something you want have in a low-carb high-fat diet. So do the experiment. Figure out how much dairy is healthy for you, and be sure to notice the level of sugar in your milk products. Milk can be a sneaky carbohydrate source for some people who don’t bother checking to see what’s in their foods. If you drink coffee or tea, heavy cream is a great alternative to milk. And if you want to avoid dairy entirely, be careful with the substitutions. A lot of them also have very high levels of carbohydrate.